The greenhouse gasses keep the Earth 30° C warmer than it would otherwise be without them in the atmosphere, so instead of the average surface temperature being -15° C, it is 15° C. Carbon dioxide contributes 10% of the effect so that is 3° C. The pre-industrial level of carbon dioxide in the atmosphere was 280 ppm. 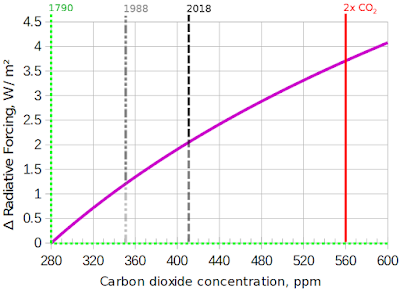 So roughly, if the heating effect was a linear relationship, each 100 ppm contributes 1° C. With the atmospheric concentration rising by 2 ppm annually, it would go up by 100 ppm every 50 years and we would all fry as per the IPCC predictions. As you can sees the, y-axis goes from 230 to 270, that's key to this. We can assume that W/m2 are related to temperatures. As a guide, from Wiki: When 1361 W/m2 is arriving above the atmosphere (when the sun is at the zenith in a cloudless sky), direct sun is about 1050 W/m2, and global radiation on a horizontal surface at ground level is about 1120 W/m2. After publishing my experiences talking to science 'dismissives' (or 'skeptics', or whatever you'd like to call them) and then participating in the excellent Denial101x course, I was invited to join the volunteer team at SkepticalScience last year. 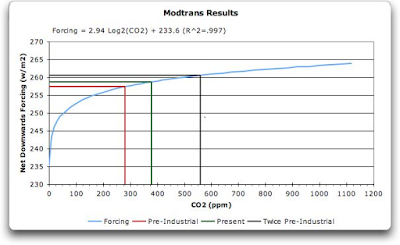 But before all that, one of the dismissives drew my attention to a climate science paradox... Scientists agree that the greenhouse effect is approximately logarithmic — which means that as we add more CO2 to the atmosphere, the effect of extra CO2 decreases. In the last million years, CO2 levels have cycled between about 180 and 280 ppm during cycles about 100,000 years long. Because this happened in the steep part of the curve, a change of only 100 ppm (together with the Milankovich cycles) was enough to move the world in and out of the ice ages. 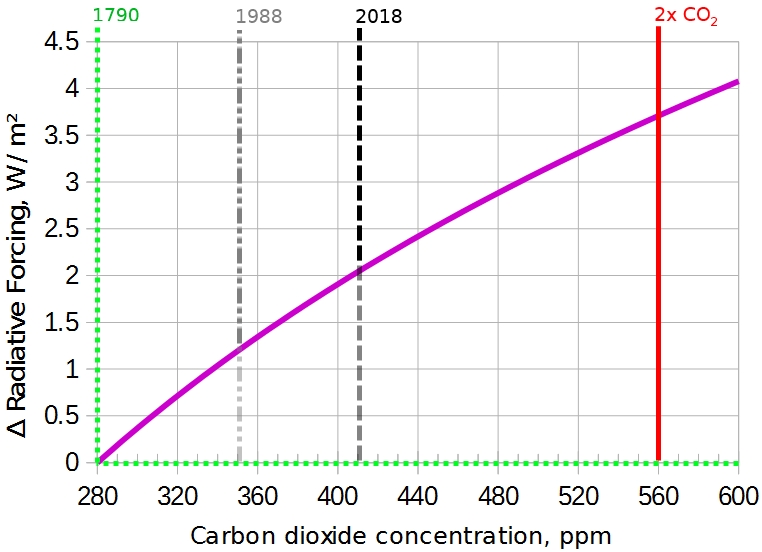 Even though humans have increased the CO2 concentration by 130 ppm already, this extra 130 ppm has a smaller effect than the 100 ppm that was added naturally before. After zooming in, the logarithm doesn't make such a big difference: it's not far from a straight line. 560ppm will probably take us well beyond the Paris target of 1.5°C, so the 280-560 range is key; we would be unwise to let our civilization go beyond 560. Sure, looked at close up, any part of any curve looks like a straight-ish line. But look at the y-axis, it goes from 0 to 4.5. 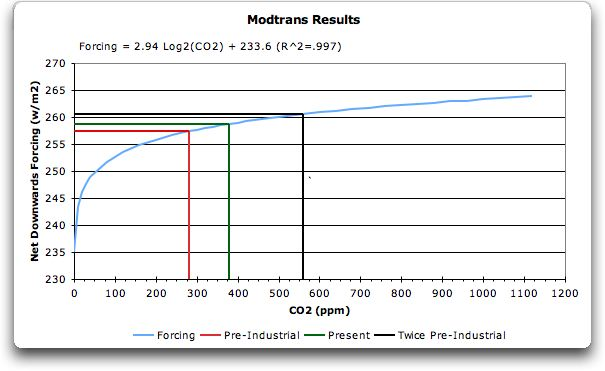 The W/m2 increase (resulting from a CO2 increase from 280 to and 560 ppm) of just under 4 agrees to the first chart, which shows an increase from 257 to 261. But the y-axis is a tad misleading, to say the least. They are also (deliberately?) confusing units. Fag packet* says 3.7 additional W/m2 = temperature increase (if CO2 levels doubled from pre-industrial levels) no more than 1C. * Average earth surface temperature 288K ÷ 1,120 W/m2 (when sun directly overhead in a cloudless sky) x 3.7 W/m2 = 0.95K or 0.95C. If we go by the first, more optimistic chart, the increase would be barely measurable, but let's give the warmenists the benefit of the doubt. An important EU protected habitat in its own right, it is also a stronghold for the hen harrier, a scarce bird of prey. At present, it is covered by an EU-funded conservation project. Labour says it would scrap laws allowing private landlords to evict tenants without giving a reason. The law, in force since 1988, is thought to be the biggest cause of homelessness. Labour's shadow housing minister John Healey announced the policy at the party's conference in Liverpool. Mr Healey also unveiled plans for a £20m fund to set up "renters' unions" to support tenants in disputes with landlords. So-called "no-fault" evictions - when landlords throw people out of their home without saying why - have been growing in recent years. Rising star Emma Corrin is set to play lady Diana Spencer – the future Princess of Wales – in Netflix’s The Crown. The actor will not appear on screen until season four of the royal drama – season three is expected to be released later in 2019 – but her casting is a major step forward for the young British star. The series has managed to cover Royal history from the 1950s to the 1990s in about four years, at this rate, they will be as far as Harry/Meghan in two or three years' time. So the interesting question is, which actress will play Meghan Markle, who is herself an actress with a real life job of playing a Royal? If they manage to persuade Meghan to play herself, then the real and a parallel universe will overlap. If not, we'll have an actress playing an actress playing a Royal, which is also pretty self-referential. Either way, I expect that Meghan will have strong opinions on who gets to play her part. This'll be fun. One drug gang is thought to have made £1.28 million worth of sales from a panel in Whitechapel. After the call facility was switched off, there was a “significant decrease in anti-social behaviour” in the streets around the phones, a council spokesman said. Assuming that catching drug suppliers and their customers is a worthy aim (it isn't, but the law is the law), that's the opposite of what the authorities should be doing. This is an ideal opportunity for a bit of easy data mining and a fishing expedition! Firstly, don't flag up that you know something which the other side doesn't appear to know that you know. Sift out which 'phone numbers are rung most often and which of those result in clandestine handover meetings. Maybe some customers are so dumb as to withdraw cash from nearby cash machines. So you know exactly who they are, with corroborative photos from the banks' CCTV, or maybe clear up a debit card theft. Follow callers on CCTV or for real - nowadays, it is perfectly normal to see people standing or walking around wearing an ear-piece, staring at and talking to a mobile 'phone. They can use that to see CCTV footage while keeping in contact with base - now you know where they live and/or where they meet. Clearly, you don't want to nick customers or suppliers a few minutes after they've put in their order from the public 'phone, that would give the game away, so spend a few weeks or months getting plenty of CCTV footage and incriminating photos, compiling your list of 'phone numbers, names, addresses, when the deliveries seem to come in etc. Finally, you do a dawn raid in random nearby areas at random intervals and present the Court with some nice fat folders full of evidence. Until the next generation of drug suppliers steps up to the plate, rinse and repeat until they legalise, regulate and tax the supply of the stuff. "Unregistered schools given council funding"
The BBC at its PC best. You can guess pretty well what this is about just from the headline, but you have to slog two-thirds of the way through the article before they come out and actually say it. ... inspectors said that many children were still being taught in this "murky world", with the biggest number in London and the West Midlands. A bit like the Daily Mail articles where they don't mention the house price until the very end. Yes, but who will stand up for the thieves and adulterers? There has - quite rightly - been an uproar about Brunei's threat/promise to punish homosexual acts by stoning people to death. Anybody who thinks this is justifiable clearly has a very, very sick mind, because being gay or lesbian is in fact perfectly natural. It's not 'normal' in the sense that a huge majority aren't gay, but it is still a natural part of the human condition, like being left-handed is perfectly natural. That's not 'normal' either but perfectly natural. Some people just are. But... they intend/hope to stone adulterers to death as well. Personally, I think adultery is despicable behaviour, but it's certainly not a 'crime' that requires a state-sanctioned punishment. 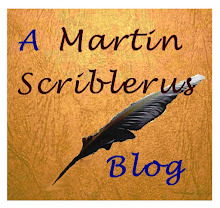 Maybe some readers are swingers, or think that adultery is not so serious; and maybe other readers take a dimmer view than I do, those are minor differences of opinion. Same goes for 'thieves'. Typical Western penalties - social shaming; fines; community service or prison in serious cases (such as burglary) - seem reasonable to me. To want to chop somebody's actual hand off requires an equally sick mind as wanting to stone people to death for non-crimes like being gay or cheating on your spouse. But unfortunately thieves and adulterers don't have their own lobby, for obvious reasons. This page contains our guidance and resources on how to comply with the rules in Great Britain. We have produced a timetable with all of the relevant deadlines. View the election timetable (DOC). If you are a candidate or agent in Northern Ireland please see Guidance for candidates and agents at European Parliamentary elections in Northern Ireland.